In November of Year 3 Aquarius I had the honor to join Lady Krystel and Lady Bitterwind at PURE Sanctuary Temple to honor Rev. Becci Penry as she turned over Headship of the Temple to Rev. Kim Reffett. It was an emotional occasion. Lady Becci has been very important to all of us, and has been very active in the Tradition for many years -and no doubt will continue to be. But circumstances were such that she needed to make a move and relocate to Florida with her partner Shelly. We understand that the move has been wonderful for them and that they are very happy there -and we are glad of this. It was particularly good to see a smooth transition of leadership in PURE Sanctuary, and Rev. Kim Reffett has done a great job as the new Temple Head. Reanna is the first Dedicant at PURE Sanctuary to be ready for initiation under Rev. Kim's Mentorship, and it was a great pleasure to have the ceremony held at the Mother Temple's new space in Hoopeston. ​It has been a long time since the Correll Mother Temple had a dedicated ritual space of its own -for many years the Mother Temple has either met in the home of the First Priestess or First Priest, or in space proffered by other Correllian Temples. Now that Witchschool.com has set aside a dedicated space for the Mother Temple in its Hoopeston, Illinois, campus the Mother Temple is likely to preside over more public open-court rituals as well as the closed-court private rituals and initiations it has always offered. The great altar of the Mother Temple. ​This was the second initiation to be held in the building, the first being Rev. Vera Lynn from Canada who had her Initiatory Confirmation here in October of Year 3. But it was the first initiation to be held in the upstairs section that will be used by the Mother Temple and using the altar furnishings of the Mother Temple. 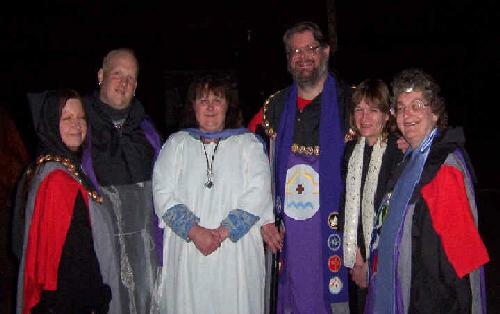 Participants in the initiations, L to R Rev. Ruthann Amarteifio, Rev. Casey Carraher, Rev. Reanna, Rev. Don, Rev. Kim Reffett, and Rev. Bitterwind. ​It was a beautiful ceremony -of course we can't discuss the ritual itself because the details of initiations are private. But it was moving and deeply felt by all present. Rev. Kim, First Elder Bitterwind, who is a member of PURE Sanctuary, Rev. Ruthann of Akasha, Rev. Casey of Akasha, and First Priest Rev. Don facilitated the ceremony. Meanwhile Outer Court Members of PURE Sanctuary waited downstairs in the Broom Closet store section of the building, socializing and waiting to greet the new Priestess. Rev. Reanna and Rev. Kim pose with Rev. Don after the ceremony. We first met Reanna a few years ago at Awakenings Bookstore and we have watched her growth with great pleasure. She has joined us for Lustrations in the past, and has been a member of PURE Sanctuary for some time. Lady Ruthann and I were honored to be part of her initiation and are sure she will be a great Priestess. We are glad to have her in the Tradition. May the Blessing Be upon her and all her works! PURE Sanctuary Temple members Vicky, Rev. Kim, Rev. Reanna, Marylynn, and Rev. Bitterwind.